2006 Le Mans Series LMP2 championship winning team Barazi-Epsilon, along with LMS P2 champion drivers Juan Barazi and Michael Vergers, announced today that they will defend their titles next season with an all-new 2007 Zytek 07S LMP2. "It was a long and very difficult choice - we had excellent proposals from every LMP2 manufacturer,” says Barazi-Epsilon co-founder Michel Lecomte. “And now we are tremendously excited by the challenge - to be the first team to run this new car, and to develop a strong technical collaboration with the Zytek factory in order to win again in a very competitive category." This naturally means that Zytek is pushing ahead with its new chassis, to the latest regulations. Although that’s the way it has worked out in recent seasons, Trevor Foster makes it clear that the company hasn’t been keen to run as a factory team – but with Barazi-Epsilon confirmed as an LMP2 customer, all he needs now is an LMP1 customer or two. “We’re talking to a couple of teams about LMP1 cars,” is as far as he’ll go at the moment, although negotiations are also on-going as regards a home in the ALMS for the 2006 hybrid car, which ran so well at PLM and Laguna Seca (right). The 3.4 litre LMP2 power unit has been run in the Binnie Lola this season, with some excellent results. 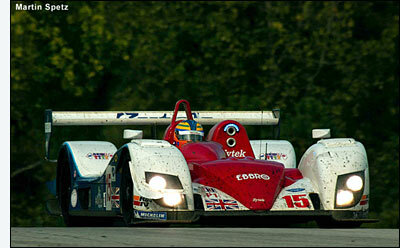 The Barazi-Epsilon team will continue to use Michelin tyres, as it targets Le Mans Series and Le Mans success in 2007. As LMS Champions, the team has a guaranteed entry for the 24 Hours next year. A third driver to partner the 2006 champions has yet to be chosen. 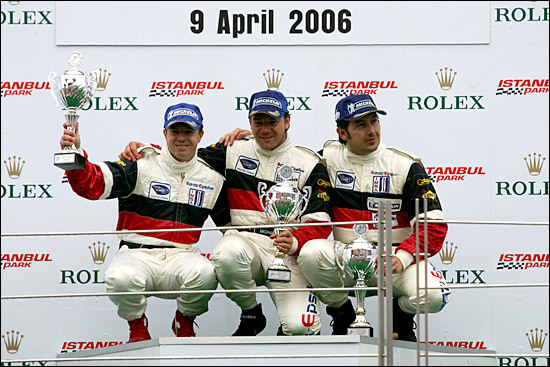 Here are Jean-Philippe Belloc, Michael Vergers and Juan Barazi celebrating victory in P2 at Istanbul at the start of this season.